The People’s Bank Of China (PBOC) has added 16 tonnes of gold to its official reserves now totalling 1,694 tonnes in August 2015. The gain in August is the third monthly increment in a row after a period of silence by the PBOC since 2009. The change in reporting, the amounts reported and the fact the gold is mark-to-market is a clear sign of a strategy not merely aimed at SDR acceptance. More so to prepare for a post-dollar international monetary system. China is joining Russia in increasing its official gold reserves on a monthly basis. Russia added a whopping 31 tonnes in August, the highest since March and the fourth highest in recent history. These two countries are by far the largest official gold buyers globally, which can only be seen in the greater scheme of things. China and Russia both form a threat to US dominance by the size of their economies (Russia is tenth largest economy, China is the second largest economy), the multilateral collaborations organized around the Eurasian continent, bold statements about the necessity of gobal de-dollarization and gold accumulation in anticipation of a new international monetary order. The threat to the US dollar hegemony is underlined by adjustments in purchases of US government bonds (US Treasury’s – USTs) by China and Russia. US bonds have been the central pillar of the international monetary system for decades, but are not able to serve this purpose indefinitely. Issuance of USTs, to supply international reserve assets, gives the US an exorbitant privilege in funding to the detriment of all other nations. Furthermore, massive global demand for USTs lowers its coupon interest rate, feeding into to bubbles that eventually contaminate the world economy. 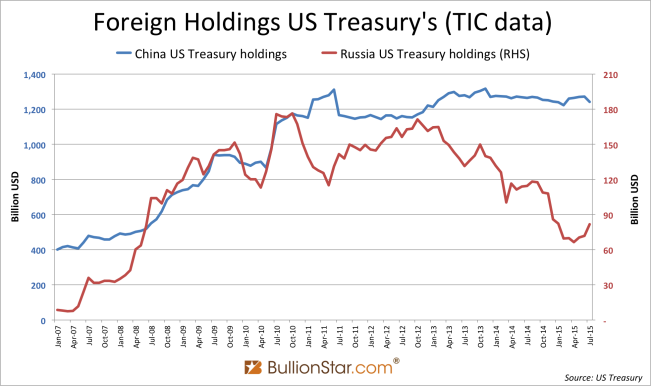 China’s USTs holdings have been steady since 2010, while its total foreign exchange reserves have mushroomed by $890 billion over the same period, from $2,761 billion in October 2010 to $3,651 billion is July 2015. Clearly the PBOC has diversified reserve assets worth hundreds of billions of US dollars. What the PBOC exactly has bought remains unknown – though we do know it has purchased physical gold. 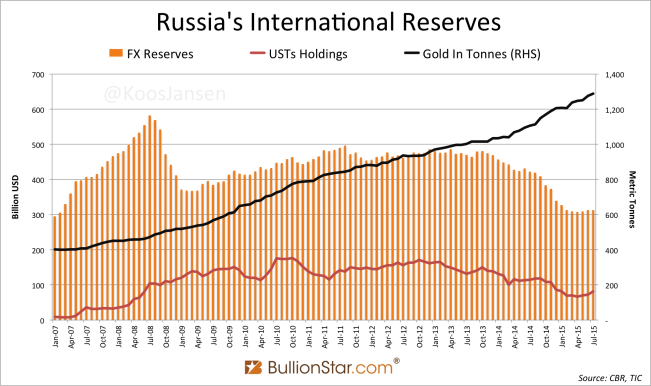 In the next chart we can see that Russia lowered its foreign exchange (FX) reserves by $200 billion in 2008 , while it was not selling USTs or gold. In contrast, we can see that from the moment the Ruble came under pressure in 2014, Russia decided to sell USTs, while continuing to add gold. Additionally, the mixture of Russia’s FX reserves in January 2015 was 46.1 % euros and 39.6 % dollars, while in January 2014 it was 41.5 % euros and 44.8 % dollars. In recent months China has followed a similar path. Downward pressure on the renminbi lead to a sell-of in foreign exchange reserves by the PBOC – possibly USTs were sold through a proxy – while it continued to add gold to its reserves. China and Russia signal the world they much rather prefer gold over US dollars. Although, in my view China’s approach in increasing its official gold reserves differs from that of Russia. Many clues suggest the PBOC has more gold than it discloses. Recent research has pointed out the PBOC is able to purchase vast quantities of gold abroad ‘of the radar‘. These gold flows do not commingle with non-monetary gold flows, visible in customs data from Hong Kong, Switzerland or the UK, that in the Chinese domestic gold market are sold through the Shanghai Gold Exchange to the private sector. 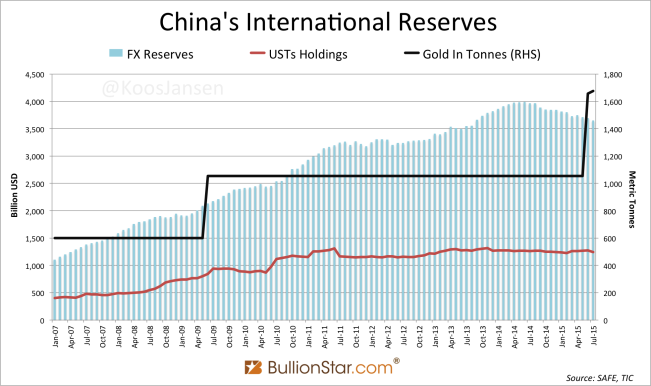 The reason for under stating its official gold reserves is that China is the elephant in the room, being the second largest economy in the world and having the largest FX reserves. China must covertly buy gold not to disturb the gold market or shock the international monetary system, as it needs more time to mature its domestic economy. 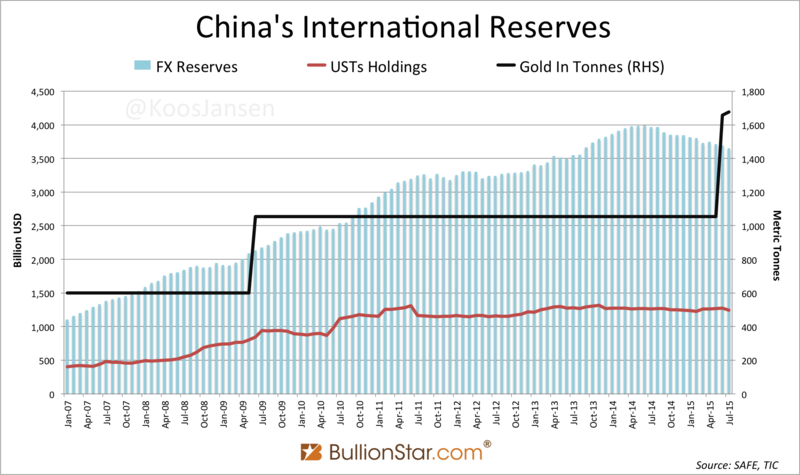 The increases in China’s official gold reserves in July (19 tonnes) and August (16 tonnes) can be viewed as carefully weighed steps pushing for a post-dollar international monetary system. Gold being the US dollar’s Kryptonite. Considering all mentioned above I don’t think the PBOC is honest in its reporting on official gold reserves. Very likely the People’s Bank Of China currently has more than 1,694 tonnes of gold stored locally and has not purchased 16 tonnes in August, but “16” was the figure they saw fit to disclose within their strategy. Examples of the multilateral collaborations organized by China and Russia are the Eurasian Economic Union (EEU), the Asian Infrastructure Investment Bank (AIIB) and the BRICS Forum – projects that eventually will be interconnected. These institutions are meant to pave political and economic infrastructure, whereas gold is used to apply a shift in reserves and change currency management. The intensions from these newly industrialized nations are not hard to read. If they will succeed in coming years is secondary.